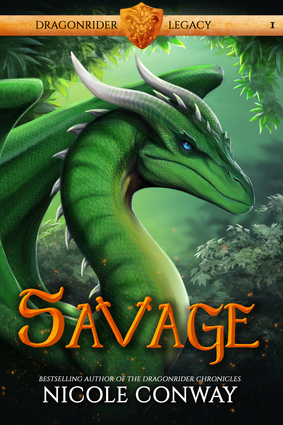 Savage begins the Dragonrider Legacy series, a thrilling companion to the international bestselling Dragonrider Chronicles.Never send a hero to do a monster's job.Forty years have passed since Jaevid Broadfeather brought peace to Maldobar and Luntharda. But that fragile truce will be tested as darkness gathers on the horizon. The vicious armies of the Tibran Empire have crossed the far seas and are threatening to destroy Maldobar completely. Not even the dragonriders can match the Tibran war machines. And after an attempt to awaken Jaevid from his divine sleep fails, the fate of Maldobar is looking grim.Reigh has never known what it means to be a normal human. Raised amongst the gray elves in the wild jungle of Luntharda, he's tried everything to fit in. But the dark power within him is bursting at the seams—refusing to be silenced. And while his adoptive father, Kiran, insists this power must be kept secret, Reigh knows he's running out of time.As Maldobar burns, the world is desperate for a new hero. Destiny has called, and one boy will rise to answer. Nicole Conway is a former freelance graphic artist for promotional companies and is now a full-time writer. She enjoys hiking, camping, shopping, cooking, and spending time with her family and friends. She is the author of The Dragonrider Chronicles. She lives in Valdosta, Georgia.